By Jarrod Jones. There have been countless schoolyard shoving matches over the years concerning who — or, in some cases, what — makes for a great supervillain. Every great villain needs a gimmick, some will say. Others need a popular hero to perpetually stymie. Maybe they just need a really cool cape. Jon Morris has a fairly level-headed opinion on the matter. While Morris seems to have a handle on the necessary qualities of what makes a great heavy, it’s the je ne sais quoi of the supervillain that turns out to be his specialty — or, more specifically, the absence of it. In his latest book, The Legion of Regrettable Supervillains, Morris dwells in what he calls the graveyard of supervillainy, where the crummier ne’er-do-wells from the Golden Age, the Silver Age, and the Modern Age reside. “I pick the bones,” he says. Through Morris’ book, forgotten nemeses like Robbing Hood and Mr. Pointer get their moment in the sun alongside the more popular — but no less screwy — baddies like MODOK and Stilt-Man. It’s a fun read, but it’s also an informative one; Morris has done his homework, and it shows. 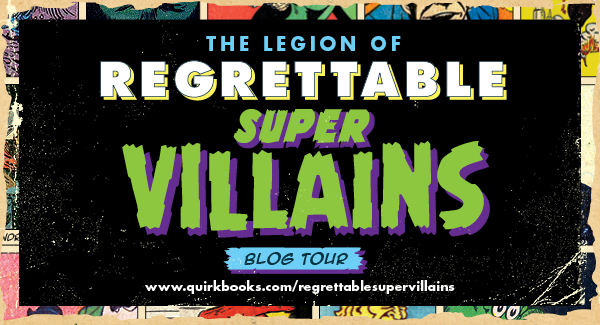 Jon Morris spoke with me in the midst of his Blog Tour to discuss The Legion of Regrettable Supervillains, the more dubious character traits found in the Golden Age, and the qualities of what makes a supervillain great. 1. Your blog, Gone & Forgotten, has long been a valuable archive containing the lost, the forgotten, and the best-forgotten artifacts from the annals of comic book history. How does it feel to air the dirty laundry of legends? Jon Morris: It’s a privilege and a great responsibility. 2. What’s the criteria for a “regrettable” supervillain? How does The Puzzler end up on the list but characters with similar gimmicks — like The Riddler or Cluemaster — don’t? Does prominence have something to do with it? JM: In the specific case of the Puzzler, his regrettability is firmly rooted in the fact that he was to be permanently overshadowed by the higher-profile Batman villain, despite having a more compelling origin, an arguably better (or at least more absurd) costume and snappier puns. He was an entertaining bad guy, but he’s always going to be perceived as a Riddle ripoff. That’s usually the criteria, that there’s something about the character which prohibits them from gaining the respect and attention which is seemingly due to them. Either a character only pops up in the little-seen titles of a Z-List publisher, only gets one appearance, dies ignobly, is enmeshed in legal complications, is tied to a fleeting cultural fad, or is affixed to some unfortunate or grotesque stereotype – that’s the start of true regrettability. Beyond that, it also helps if they’re roaringly goofy. 3. Between this book and “The League of Regrettable Superheroes”, have you ever received feedback from a character’s creator? Did you ever get an email from a comics vet with the subject line “HEY!”? JM: I’ve never been sassed by a creator as far as the books go. The fans are a different matter; From the Superhero book, I’ve had to justify ROM Spaceknight to more than one person. And Doll Man has a surprisingly large fanbase, although I’ve noticed that a lot of them seem tied to the “large woman/tiny man” fetish community, bless their hearts. It’s good when someone knows what makes them happy. I have gotten clapback from creators of books covered on the blog, though not too often. I remember one creator whose credits were primarily of the “My dad is famous” variety excoriating me over email, then sending duplicates of that email to literally every social media platform I was using at the time. I suspect that his feelings were hurt. Additionally, about once every two years since 2004 or so, I receive an email from the creator of a ’90s book of middling popularity, taking me to task for giving his book a bad review. I should point out that I’ve never reviewed his book and I have no idea who he thinks he’s contacting. Still, if it gives him an outlet for his frustration, that’s fine by me. At least I’m being useful. 4. You’ve said that the term “regrettable” shouldn’t necessarily be taken to its fullest extreme. But has there ever been a moment where you came across a certain forgotten character and said, “Oh, that’s a shame”? JM: The ethnic stereotypes are always disappointing, particularly if they come from a creator whose work, in general, you enjoy. If not just because they devalue the human experience with their blithe degradation, they also tend to be fairly boring characters. I strongly suspect most of these writers who have, as an example, introduced a Chinese character who cannot pronounce his “R”s are capable of so much better. It’s lazy as well as demeaning. 5. Walk me through how you conduct your research. Have publishers opened up their archives for your perusal? Or are they all, “Nice try, fella, you know where the library is”? JM: I am very much left to my own devices when it comes to finding the source material, owing in no small part to how many of the publishers whose characters I cover have long since gone defunct. I pick bones out of the graveyard, and all that. There’s a pretty time-consuming aspect to the books and blog, wherein I have to hunt down copies of the books I want to write about from local comic shops and assorted online realtors. What’s frustrating about this is that I used to have an immense comic collection – fifteen thousand books the last time I counted, and many more added after that – but I reached my limit with them more than a decade ago. I either sold or gave away practically every one of them. Then a few years passed, and only then did I get a book deal which required a library of thousands of comic books. C’est la vie. JM: Egg Fu should definitely come to mind in this context, because if ever a character should be left in obscurity, it’s him. Even the most successful re-imagining of the character – which, I’d argue, was Grant Morrison’s take from the weekly DC Comics “52” – still ends up with a yellow-skinned, egg-shaped Chinese figure named “Egg Fu.” There’s a lot which you need to walk away from to make that right. One of the small and questionable mercies of the Golden Age of comics in particular was that characters of color weren’t given a lot of exposure in the first place, which means they rarely were the villains of the stories*. They were sometimes the heroes or the sidekicks, though, and that was bad enough. If you ever look up Captain Marvel’s pal “Steamboat” or “Whitewash Jones” from the Young Allies, you’ll get yourself a short, sharp lesson about the so-called innocence of the medium’s infancy. Of course, the ethnic stereotyping doesn’t begin and end with the Golden Age. I do find it easier to discuss these depictions as they’ve occurred in the last forty years or so, since the language to discuss them in a meaningful way has finally seeped into the contemporary, mainstream discourse. *I’m obviously excluding the Japanese here for the duration of wartime, because they really got the brunt of it. 7. 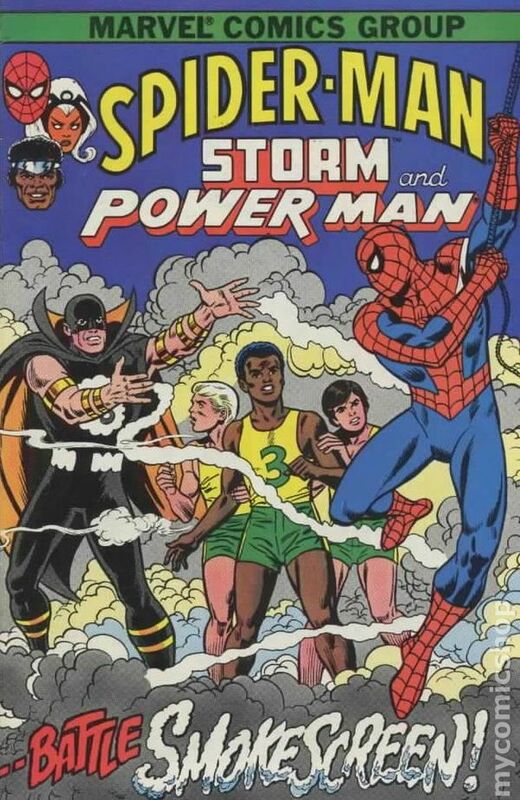 When I came across Smokescreen, the pro-smoking ne’er-do-well from the 1982 Marvel PSA comic ‘Spider-Man, Storm, and Power Man’ I nearly died. That comic got passed out when I was in elementary school, and even though I kept that comic — how often are comics distributed at schools? — I always thought to myself, “what a chump of a villain.” Which villains contained within your latest book are holdovers from when you were younger? Which of them are there strictly for comeuppance? JM: I really laid into the Daredevil villains, mostly because that was one of my two or three favorite books when I was a kiddie-wink. Frankly, I left out an unconscionable number of runners-up; Man-Bull, the Jester, Madame MacEvil, and so on. But, then again, I couldn’t bring myself to list any Superman villains (despite his having some doozies), even though Superman was my number one favorite book, as a young’un. My therapist will have to unravel the reasoning. 8. What do you think makes a great supervillain? What qualities make them timeless? JM: It seems to me that villains require less definition than heroes might. It’s definitely fair to say that heroes need a foe, or at least some opposition, to give their mission against injustice some sort of pushback. By contrast, villains can be driven by absolutely personal motives. You can definitely have a villain‘s story, devoid of heroes, and have it be just as compelling as any protracted fight scene, if not more. If I had to identify the best qualities, it’s these; Like the heroes, the best villains need a gimmick, a distinctive appearance, and something resembling an origin to better give them context. Villains should have a supporting cast, even if it’s henchmen or the heroes they fight (See, for instance, Doctor Doom, whose history is not only jam-packed with allies, underlings, and the occasional vat-grown offspring, but whose relationship with the Fantastic Four dates back to their mutual origins). And it helps if they have a goal beyond theft and anarchy, something which defines them and a target at which they relentlessly shoot. 9. Are there any supervillains who have stood the test of time that you would otherwise induct into the Legion of Regrettable Supervillains? I’d toss the Mad Hatter in there, myself. JM: Well, I obviously already pushed the limits on MODOK, Batroc the Leaper and Stilt-Man, three Marvel Comics villains who’ve managed to maintain something like a place of prominence in the comics – Batroc’s already been in one of the Marvel films, and MODOK seems like such an obvious choice that I expect he’ll be on screen in the next three or four years. With Daredevil on television and the upcoming Defenders, I also have to assume that Stilt-Man will pop up (as it were), as well. Batman’s rogues gallery is typically cited as the best in comics, but there are still literally dozens of his foes who are distinctly absurd, goofy or ridiculous. I mean, the mere fact that Batman is a heavily-armed martial artist who’s a master of every fighting technique in the world and one of his deadliest enemies is a short fat man with a monocle and an umbrella seems to speak volumes. 10. Between the members of The Legion of Regrettable Supervillains and The League of Regrettable Superheroes, which two would you pair up for a 2017 reboot series? JM: No one has ever asked me this question before, and I’m really excited! I can think of a few off the top of my head. The Eye, a flaming disembodied ocular organ capable of nearly omnipotent tasks, would make a perfect foe for The Horrible Hand, a flaming disembodied mitt capable of doing mid-air chokes and all kinds of other, exciting tricks. The heroic Pat Parker, a.k.a. War Nurse, could hold her own against any number of sinister doctors, such as Dr.Voodoo or Dr.Dracula. And Robby Reed, possessor of the powerful H-Dial which lets him become a random superhero with the spin of a wheel, would make an interesting opponent for the variable villainy of Animal-Vegetable-Mineral Man. But I would say that the money match-up would inevitably be between the Red Bee – a two-fisted hero who fought crime with the power of a single trained bee which he kept inside his belt buckle – and Swarm, a former Nazi horticulturist whose body, after a terrible and totally preventable accident, is now made up of radioactive killer bees. It writes itself! And it might answer the question of how many bees the Red Bee can actually fit inside his belt buckle! 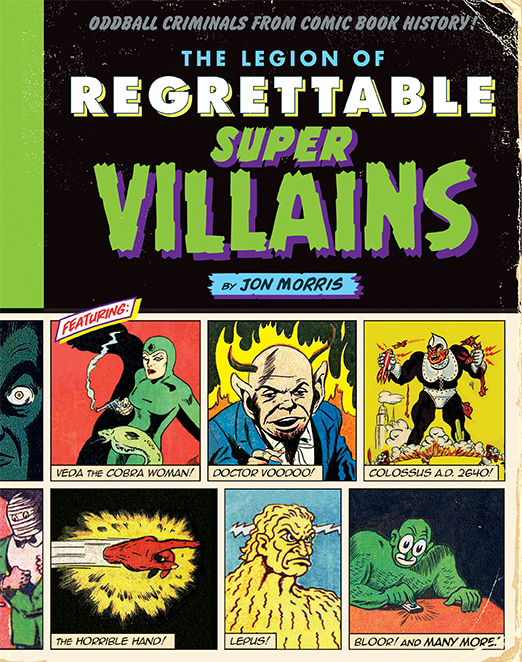 You can purchase your copy of ‘The Legion of Regrettable Supervillains’ at QuirkBooks.com!